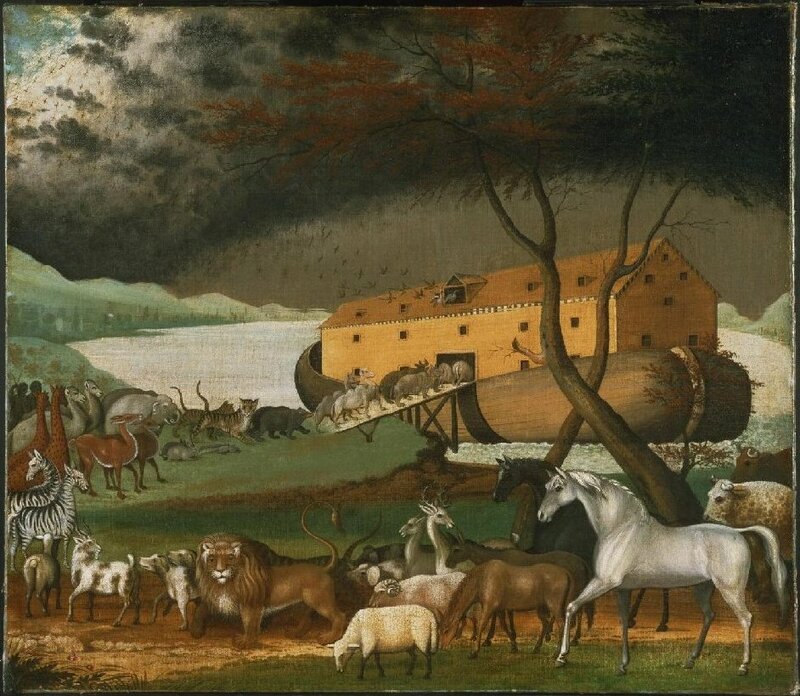 As a child, I was fascinated by the story of Noah. It presented images that both frightened and inspired; and I remember the fear I felt contrasted with my mother’s voice as she calmly read out the story to me. She sat on the side of my bed. I huddled under the blankets, grateful for her presence, dreading the outcome for those who scoffed at the idea of a great flood, knowing that I too, ignored many warnings sent to me. As an adult, I am washed by love-dread emotions when reading the story. Perhaps the vivid pictures in my story book of drowning people banging against the side of the ark, pleading to be let in, still haunt me. As an adult, Jesus’ words today recall all the times I have thought I know the future better, all the times I thought I understood the past more deeply, and all the times I have lived my present without fully understanding myself and my surroundings. I think of our recent election in the U.S. and I wonder . . . who among us has taken heed of the prophecies . . . and who has not? Am I riding in the ark of Christ wondering if I have made the right decision? Or am I hammering at the side of the ship? Jesus says: As it was in the days of Noah, so it will be in the days of the Son of Man; they were eating and drinking, marrying and giving in marriage up to the day that Noah entered the ark, and the flood came and destroyed them all. Where am I in this story? Who has built the ark and how large is it? What other life does it carry? Does my name appear on the manifest? Jesus says: Whoever seeks to preserve his life will lose it, but whoever loses it will save it. What does this inversion mean for me today? How am I to enact this teaching in my life? How do I best demonstrate my love for God? Do I accurately reflect God’s image in a troubled world? Jesus says: On that night, there will be two people in one bed; one will be taken, the other left. Those who read scripture from a fundamental perspective preach the rapture, a time when the chosen are taken into heaven while the condemned are left behind. There are days and nights when I almost believe this notion, but then I remember how Jesus leaves the ninety-nine to find the one who is lost. I remember the stories of the prodigal son and his forgiving father, the woman at the well and the compassionate Jesus. I remember my mother sitting on my bed to read out the dreadful but lovely words of Noah and his family shutting themselves and the animal kingdom – two by two – into the ark to wait for another beginning. What are we to make of this story? How does it play out in our lives today? How different are we in 2016 from those who peopled the planet in the days of Noah? And how does this knowledge change the way we act as we go out into the world for a new beginning each day? For the story of Noah, read Genesis 7-9. Jesus poses a question to us. Suppose one of you has a hundred sheep and loses one of them—what do you do? Jesus shows the path to us. You leave the other ninety-nine sheep in the pasture and go looking for the one that got lost until you find it. Jesus recalls our humanity for us. When you find it, you are so happy that you put it on your shoulders, and with great joy you carry it back home. Jesus models a faith-filled life for us. When confronted with an enormous problem or a nagging worry, we consider the abiding faith Jesus shows us when he abandons the ninety-nine in search of the one. Might we be so courageous as to allow God to guide our actions? We also consider the hopeful persistence Jesus displays as he endures in his search for the one lost sheep. Might we persevere and allow God to bolster our work in the kingdom? And we consider the compassionate, joy-filled mercy with which Jesus celebrates. Might we be as exuberant in our love for even the darkest of our nights and the most difficult of our days . . . always knowing that these trials will ultimately bring us great joy? When we use the scripture link and the drop-down menus to compare varying translations of these verses, we find that in our darkest circumstances, in our longest battles, and in the narrowest of places, Jesus shows us that with the Good Shepherd we might find the faith, hope and love to celebrate with great joy.